Phased deployments automate a coordinated, sequenced rollout of software across multiple collections. For example, deploy software to a pilot collection, and then automatically continue the rollout based on success criteria. Create phased deployments with the default of two phases, or manually configure multiple phases. The phased deployment feature was first introduced in version 1802 as a pre-release feature. Beginning with version 1806, it's no longer a pre-release feature. Deployments created by phased deployments aren't viewable to any administrative user that doesn't have the All security scope. For more information, see Security scopes. Before creating a phased deployment, distribute the associated content to a distribution point. Application: Select the target application in the console and use the Distribute Content action in the ribbon. For more information, see Deploy and manage content. Task sequence: You have to create referenced objects like the OS upgrade package before creating the task sequence. Distribute these objects before creating a deployment. Use the Distribute Content action on each object, or the task sequence. To view status of all referenced content, select the task sequence, and switch to the References tab in the details pane. For more information, see the specific object type in Prepare for OS deployment. Software update: create the deployment package and distribute it. Use the Download Software Updates Wizard. For more information, see Download software updates. These settings are unique to phased deployments. Configure these settings when creating or editing the phases to control the scheduling and behavior of the phased deployment process. Deployment success percentage: Specify the percent of devices that need to successfully complete the deployment for the first phase to succeed. By default, this value is 95%. In other words, the site considers the first phase successful when the compliance state for 95% of the devices is Success for this deployment. The site then continues to the second phase, and creates a deployment of the software to the next collection. Number of devices successfully deployed: Added in Configuration Manager version 1902. Specify the number of devices that need to successfully complete the deployment for the first phase to succeed. This option is useful when the size of the collection is variable, and you have a specific number of devices to show success before moving to the next phase. Automatically begin this phase after a deferral period (in days): Choose the number of days to wait before beginning the second phase after the success of the first. By default, this value is one day. Manually begin the second phase of deployment: The site doesn't automatically begin the second phase after the first phase succeeds. This option requires that you manually start the second phase. For more information, see Move to the next phase. This option isn't available for phased deployments of applications. Starting in version 1806, configure this setting for the rollout in each phase to happen gradually. This behavior helps mitigate the risk of deployment issues, and decreases the load on the network that is caused by the distribution of content to clients. The site gradually makes the software available depending on the configuration for each phase. Every client in a phase has a deadline relative to the time the software is made available. The time window between the available time and deadline is the same for all clients in a phase. The default value of this setting is zero, so by default the deployment isn't throttled. Don't set the value higher than 30. Installation is required as soon as possible: Set the deadline for installation on the device as soon as the device is targeted. Installation is required after this period of time: Set a deadline for installation a certain number of days after device is targeted. By default, this value is seven days. Application (only in version 1806 or later): Go to the Software Library, expand Application Management, and select Applications. Select an existing application, and then choose Create Phased Deployment in the ribbon. Software update (only in version 1810 or later): Go to the Software Library, expand Software Updates, and select All Software Updates. Select one or more updates, and then choose Create Phased Deployment in the ribbon. Task sequence: Go to the Software Library workspace, expand Operating Systems, and select Task Sequences. Select an existing task sequence, and then choose Create Phased Deployment in the ribbon. On the General page, give the phased deployment a Name, Description (optional), and select Automatically create a default two phase deployment. Select Browse and choose a target collection for both the First Collection and Second Collection fields. For a task sequence and software updates, select from device collections. For an application, select from user or device collections. Select Next. The Create Phased Deployment wizard doesn't notify you if a deployment is potentially high-risk. For more information, see Settings to manage high-risk deployments and the note when you Deploy a task sequence. On the Settings page, choose one option for each of the scheduling settings. For more information, see Phase settings. Select Next when complete. On the Phases page, see the two phases that the wizard creates for the specified collections. Select Next. This section covers the procedure to automatically create a default two-phase deployment. The wizard lets you add, remove, reorder, edit, or view phases for a phased deployment. For more information on these additional actions, see Create a phased deployment with manually configured phases. Confirm your selections on the Summary tab, and then select Next to complete the wizard. Starting in version 1806, create a phased deployment with manually configured phases for a task sequence. Add up to 10 additional phases from the Phases tab of the Create Phased Deployment wizard. You can't currently manually create phases for an application. The wizard automatically creates two phases for application deployments. Start the Create Phased Deployment wizard for either a task sequence or software updates. On the General page of the Create Phased Deployment wizard, give the phased deployment a Name, Description (optional), and select Manually configure all phases. Filter the list of deployment phases. Enter a string of characters for a case-insensitive match of the Order, Name, or Collection columns. On the General page of the Add Phase Wizard, specify a Name for the phase, and then browse to the target Phase Collection. The additional settings on this page are the same as when normally deploying a task sequence or software updates. On the Phase Settings page of the Add Phase Wizard, configure the scheduling settings, and select Next when complete. For more information, see Settings. You can't edit the phase settings, Deployment success percentage or Number of devices successfully deployed (version 1902 or later), on the first phase. This setting only applies to phases that have a previous phase. The settings on the User Experience and Distribution Points pages of the Add Phase Wizard are the same as when normally deploying a task sequence or software updates. Review the settings on the Summary page, and then complete the Add Phase Wizard. Edit: This action opens the selected phase's Properties window, which has tabs the same as the pages of the Add Phase Wizard. Remove: This action deletes the selected phase. There is no confirmation, and no way to undo this action. Move Up or Move Down: The wizard orders the phases by how you add them. The most recently added phase is last in the list. To change the order, select a phase, and then use these buttons to move the phase's location in the list. Select Next. Review the settings on the Summary page, and then complete the Create Phased Deployment wizard. 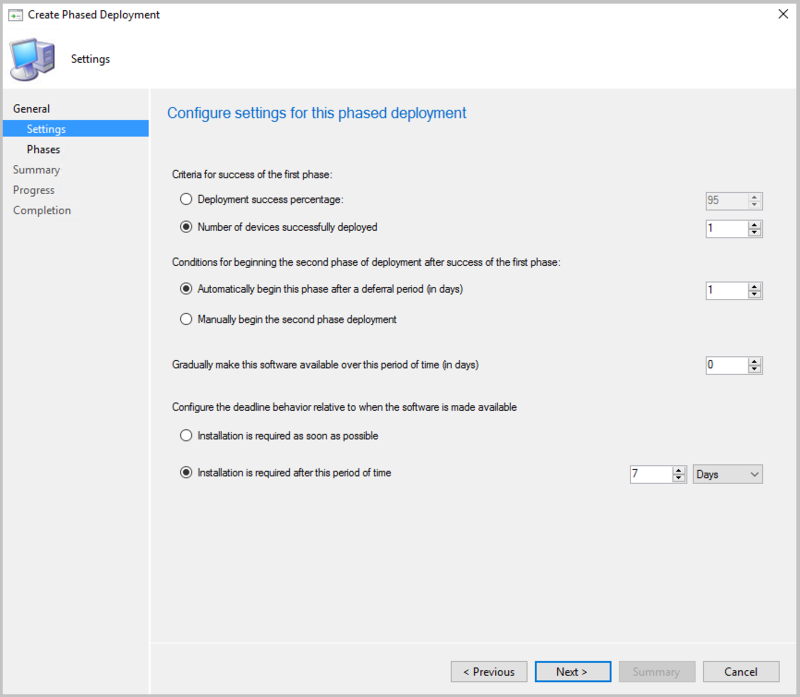 Add additional phases to an existing phased deployment. If a phase isn't active, you can Edit, Remove, or Move it up or down. You can't move it before an active phase. When a phase is active, it's read-only. You can't edit it, remove it, or move its location in the list. The only option is to View the properties of the phase. An application phased deployment is always read-only.